Andrew Renner and his son Owen are the latter, and there is video footage that cements their place in history as such. The father and his offspring were wandering the harsh wilderness of Esther Island, Alaska, in April 2018, when they happened upon a bear which was hibernating with its cubs. After not being confronted by the sleeping mother the duo decided to wander up to its den and shoot it dead at point blank range, while the cubs wailed – such power, much testosterone. The disturbing and tragic footage was captured on camera without the poachers’ knowing as the bears were part of a study conducted by the US Forest Service and the Alaska Department of Fish & Game. Motion sensors were set up so that recording would take place as the bears emerged from their den – but because of the Renners they never did. The Humane Society of the United States want people to be made aware of the vile act as such killings could become legal and commonplace in Alaska, as the Trump administration seeks to overturn legislation put in place by Barack Obama’s time in office. At present it is illegal to kill black bear mothers and cubs in their dens on the land in Alaska – but apparently a little thing like the law is not a strong enough deterrent. 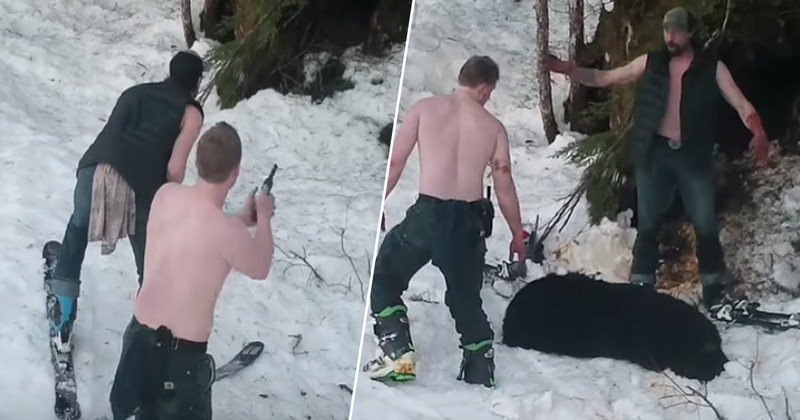 This video of a father and son killing a mother bear and her babies in their den and showing complete disregard for the lives they are taking is reprehensible. The Renners’ actions demonstrate the ruthless brutality that the government is poised to enact into law on millions of acres in Alaska, overturning a 2015 Obama-era rule that prohibits the killing of black bear mothers and cubs in their dens on these lands. This kind of killing runs contrary to the very purpose of federal public lands like national preserves and national wildlife refuges. It is too sad and too late for this mom and her babies, but not too late for the government to abandon this heartless plan to enable such killing and instead maintain the rules that protect America’s iconic wildlife. The Renners were charged with unlawfully taking a female bear with cubs, unlawfully taking bear cubs x2, possession/transporting illegally taken game x3. Andrew Renner was additionally charged with tampering with physical evidence, contributing to the delinquency of a minor and unsworn falsification in the Second Degree in August 2018. They pleaded guilty in January 2019 and received fines plus a jail sentence. The sentence also included the temporary loss of their hunting privileges and confiscation of personal property. Hunting has its place, especially in lands where survival is intrinsically linked to sourcing viable sources of food. What the Renners did was not hunting, and there is no place for it.